The property is situated in a very busy locatio on the western side of Portobello Road, close to the junction with Golborne Road . Other restaurants located in this increasingly popular location include Pizza East, and on Golborne Road the acclaimed 108 Garage, also Kipferl, Snaps & Rye, Golborne Deli, and West Thirty Six. View location map. Externally there are two tables at the front. There are two flats and a maisonette above which have been sold on long leases (one with 83 years remaining, one with 88 years) - details on request. 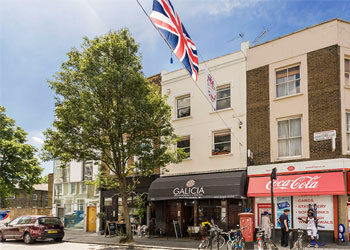 A price of £1,700,000 is sought for the freehold interest with vacant possession. Residential leaseholder's 87 Act pre-emption rights will apply. An EPC has been commissioned - a copy with recommendations will be available on request. The local authority has verbally informed us that the rateable value for the premises is £39,250 and the rates payable for the current year ending31/03/18 are £15,134. Interested parties should make their own enquiries and confirm: - Royal Borough of Kensington and Chelsea business rates department 020 8315 2082.